Dream catchers are a symbol of protection and safety. They are believed to protect people from bad dreams and spirits. 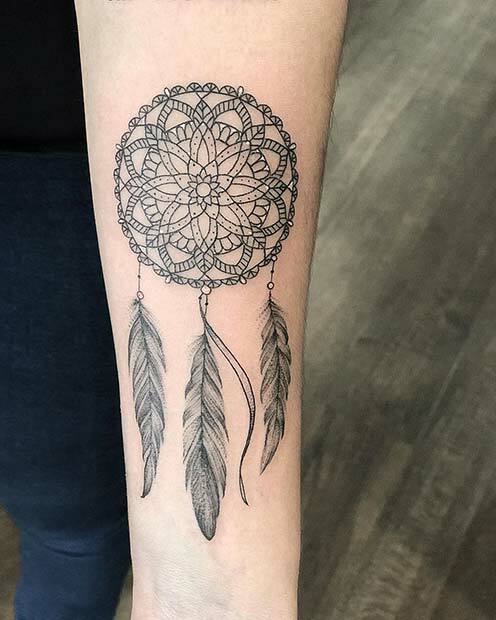 Not only are dream catchers popular in the home but many choose to have a dream catcher tattoo. 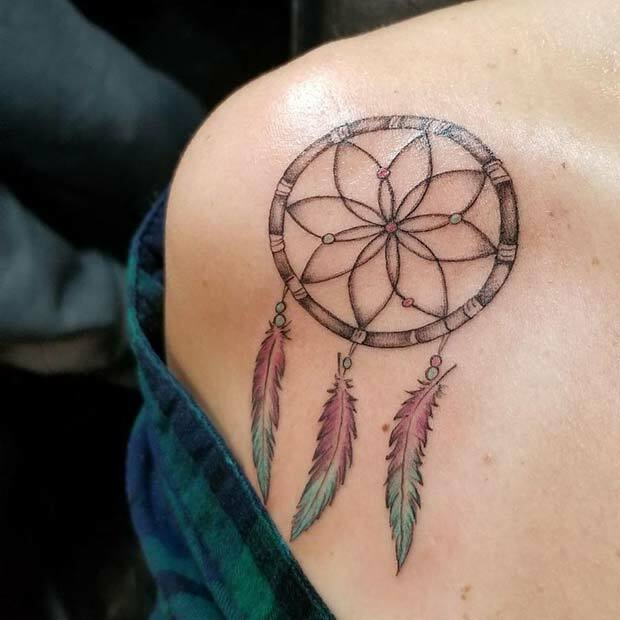 A dream catcher tattoo is believed to protect the person but can also be a symbol of Native American heritage or culture. 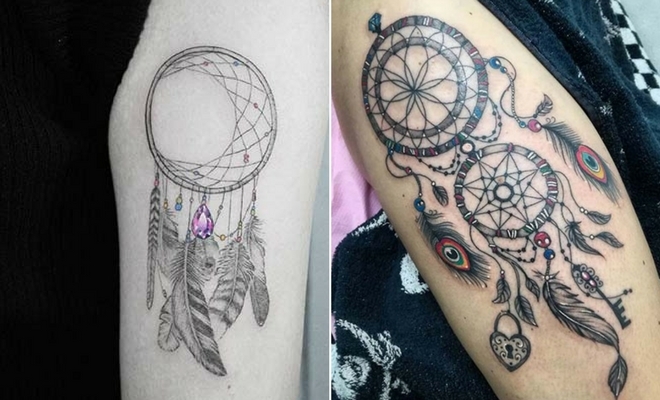 We love these tattoos and have found 23 of the of the most amazing dream catcher tattoos to share with you. By the end of the list you may be booking your next tattoo appointment! First up we have this stunning double dream catcher tattoo idea. Both dream catchers are very detailed but have a different pattern. There are also peacock feathers, feathers and other charms dangling from the dream catchers. Peacock feathers have lots of meanings including strength, renewal and pride. So, these feathers are a great addition for your dream catcher design. 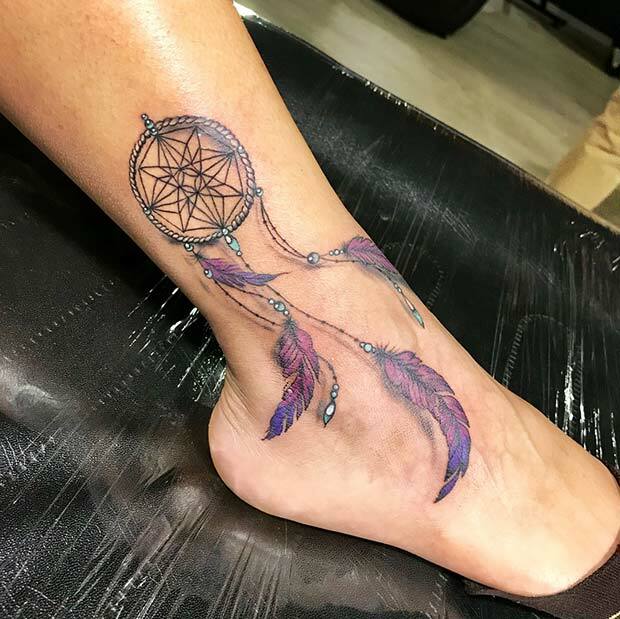 You can go for a traditional dream catcher tattoo design with the woven net or you can choose a different pattern for the inside of the dream catcher. This one has an intricate floral mandala pattern. 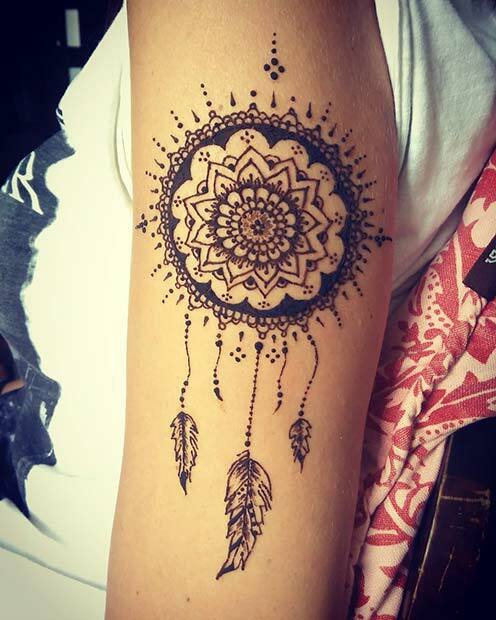 Mandala tattoos are also very popular and stylish, when combined with a dream catcher you will get one stunning tattoo. You could choose any pattern for your design. If you are looking for an elegant tattoo design, then this idea could be for you. 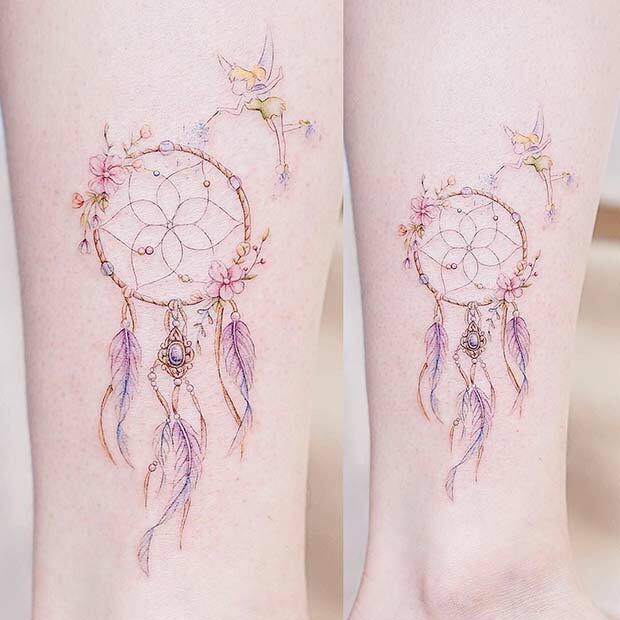 The tattoo has very delicate lines and the dream catcher has beautiful feathers, flowers and charms. This one also has a small Tinkerbell, but you can recreate something similar with or without her. Either way this will be a pretty tattoo that will suit anyone. 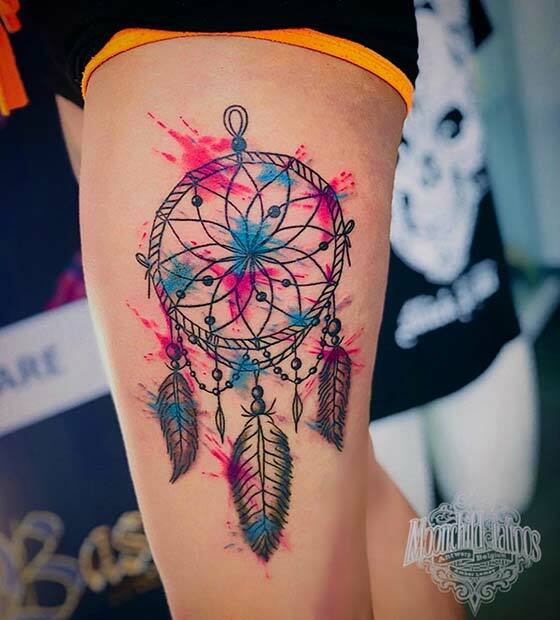 Next, we have a vibrant dream catcher tattoo idea. The dream catcher itself has a beautiful woven net design with beads, feathers and charms. Then over the top of dream catcher there are splashes of bright blue, pink and purple. We love this tattoo because it is creative, unique and uses the artistic watercolor technique. Our next idea is this dream catcher tattoo on shoulder. The dream catcher has a wooden hoop with a floral net design. There are also beads and feathers. It is super cute tattoo that would suit anyone. You can recreate the shoulder design or have a similar dream catcher placed elsewhere. Traditionally dream catchers have a wooden hoop and woven net. However, you can be creative with the idea to make your own unique design. 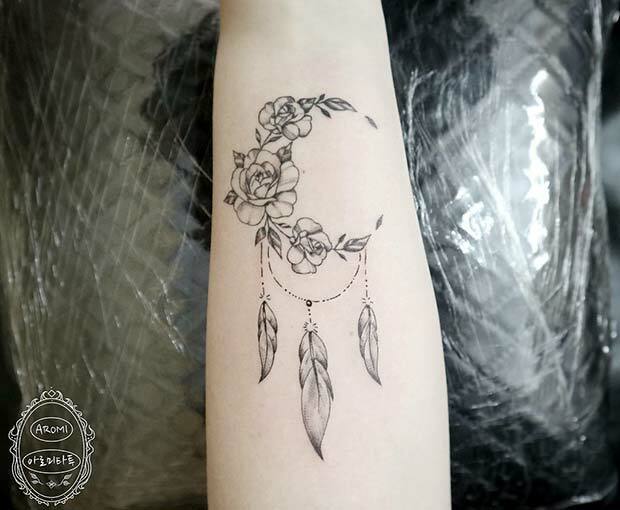 This tattoo features flowers that create half a circle or a half moon shape with the classic three feathers hanging from it. It is a creative dream catcher and we love how it combines classic designs and new ideas together. 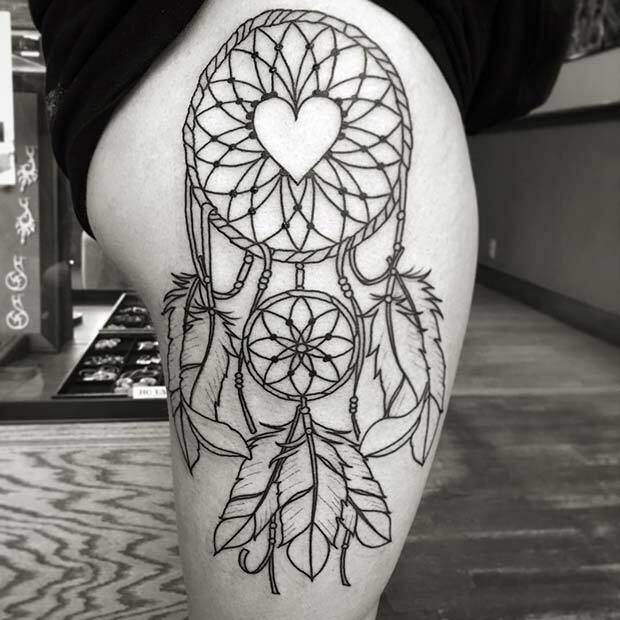 Dream catcher designs look great tattooed on the thigh. 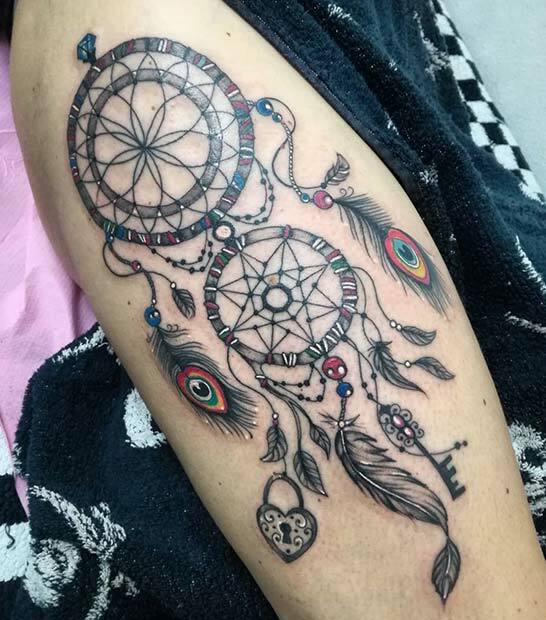 This thigh tattoo features a double dream catcher with feathers and beads. The top dream catcher has a beautiful heart design in the center. This is an amazing tattoo, you could recreate something similar with just one dream catcher or maybe add some color. Next, we have a beautiful example of a dream catcher with a mandala design. The dream catcher doesn’t have the traditional hoop but a stunning intricate pattern instead. This tattoo was created in henna, but you can have something similar created permanently. You could also try henna to see what the design looks like and henna looks great for the summer. Dream catchers look beautiful with flowers. 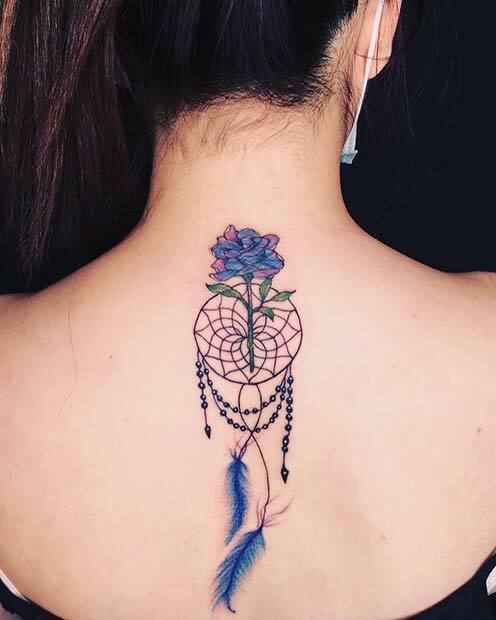 This tattoo features a small dream catcher with a blue flower, blue feathers and beads. You can have your own design like this one created. Maybe try adding your own favourite color or favourite flower to make the tattoo unique to you. The design possibilities for the net in your dream catcher are endless. This tattoo has used a geometric woven net in the center. We think it gives the dream catcher a crystal look. It also has beautiful purple feathers and beads hanging from it. You could recreate a similar dream catcher, and have it placed anywhere with any feather colors. I think that these Tattoos will help me choose what type of tattoo I want thanks!!!!!!!!! !